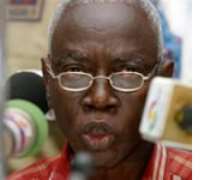 The Chairman of Ghana's Electoral Commission, Dr. Kwadwo Afari-Gyan, on Wednesday said his Nigerian counterpart, Maurice Iwu, deserves no blame for the election failures Nigeria has faced. Dr. Afari-Gyan, who visited the President of the Nigeria Labour Congress (NLC), Abdulwaheed Omar, in Abuja, said the emergence of an efficient and fair electoral system should not be left to an individual. He, however, said for credible elections to be achieved, the electoral commission, political parties and non-governmental organisations must work collectively. Speaking on the methods Ghana has used to ensure a credible electoral system, Mr. Afari-Gyan said it is compulsory that party agents are at polling stations during votes summation, and have the polling station results. He said: “In this polling station, this is what candidate 'A' got there; then it gets on the master sheet. After it is finished, all the agents must sign and in Ghana, we don't declare constituency results from the head office. The constituency returning officer is responsible for declaring the result when it is finished. “Because of the transparency in our system, we allow the media people to broadcast even polling station results. If one polling station has finished its result, the media people can put it in the public domain as provisional result, because they don't have the right to declare final results. “But we allow them to take results at various stages once it has been authenticated at any stage. That has been very helpful. By the time we ourselves get the result, the media people have announced it because they can do it on cell phone. So, we take only signed results filed.